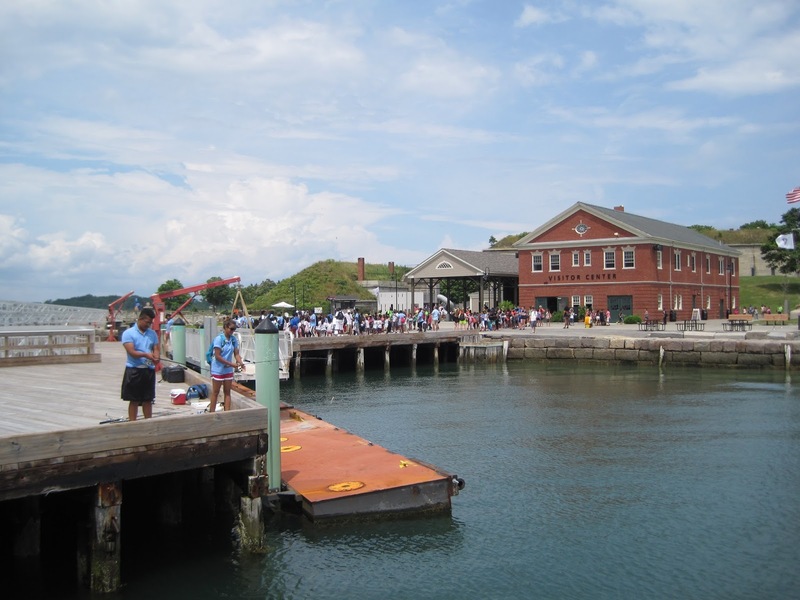 Join us for a Free Cruise to Georges Island October 14th! On Saturday, October 14th, Save the Harbor/Save the Bay will host a free fall cruise to Georges Island! 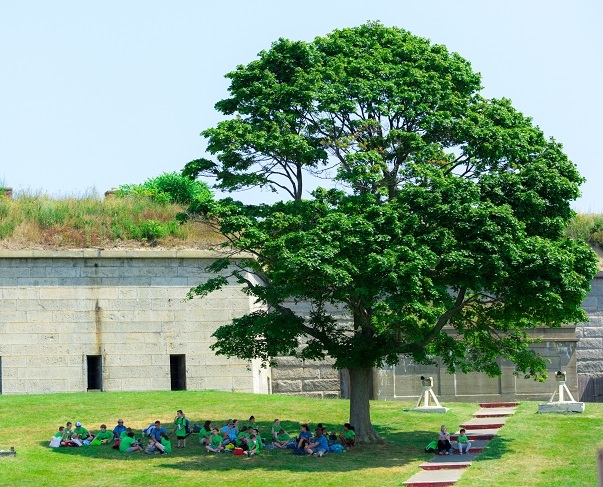 Come explore historic Fort Warren, and maybe encounter the fabled “Lady in Black” in the Dark Tunnel! We will begin boarding the Provincetown II at Bay State Cruise Company's dock at the World Trade Center in the Seaport at 9:30 AM for a 10 AM departure. The boat will depart the island at 1:15 PM for a 2 PM arrival back at the World Trade Center. To reserve your space on this free trip, fill out this Google Form! There is plenty of space on the trip, but you must RSVP to join us. 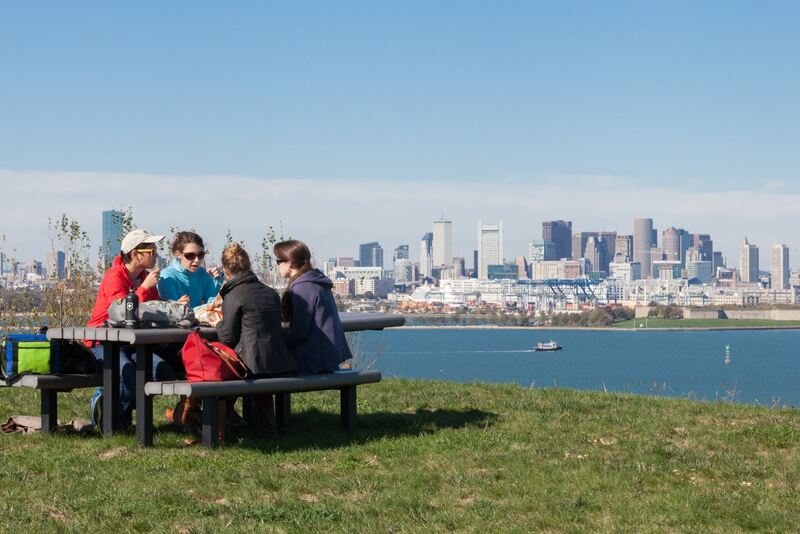 Please note that the snack bar on Georges Island will have closed for the season. You are welcome and encourages to bring a picnic lunch-- please remember that the Boston Harbor Islands National and State Park has a "carry-on, carry-off" policy, so bring a bag for your trash to dispose of back on the boat. 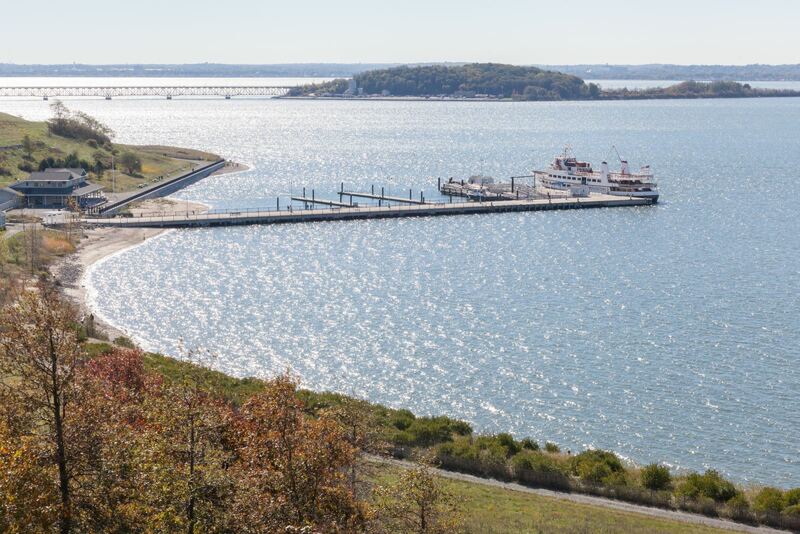 While the Visitor’s Center on Georges Island will be closed for the season, the Provincetown II will remain at the dock with bathrooms available on board throughout the day. Temperatures on the water and the islands are often cooler than in the city, especially during the fall season—dress warmly and bring layers! 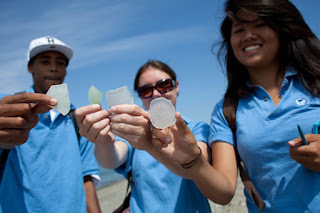 This trip is for families, individuals, and chaperoned groups of youth and teens. Strollers are permitted but can be unwieldy on the boat stairways and gangways. If you have any questions please contact Amy Gaylord via email or phone at 617-451-2860 x1008. Save the Harbor would also like to thank our supporters 3A Marine Service, Andus Baker & Rowan Murphy Family Fund, The Bay State Federal Savings Charitable Foundation, Beacon Capital Partners, LLC, Boston Bruins Foundation, Andrew J. Calamare & Marianne Connolly, Circle Furniture, Kevin & Dee Colcord, Dark Horse Capital Partners, Diversified Automotive, Tom & Lucinda Foley, Fort Point Framers, Goulston & Storrs, Legal Sea Foods, George Lewis - Haven Trust, Liberty Bay Credit Union, Mass Bay Credit Union, Massachusetts Marine Educational Trust, National Park Service, Randy Peeler & Kate Kellogg, Red Sox Foundation, SKW Partners, Inc., Storm Duds, Matthew J. 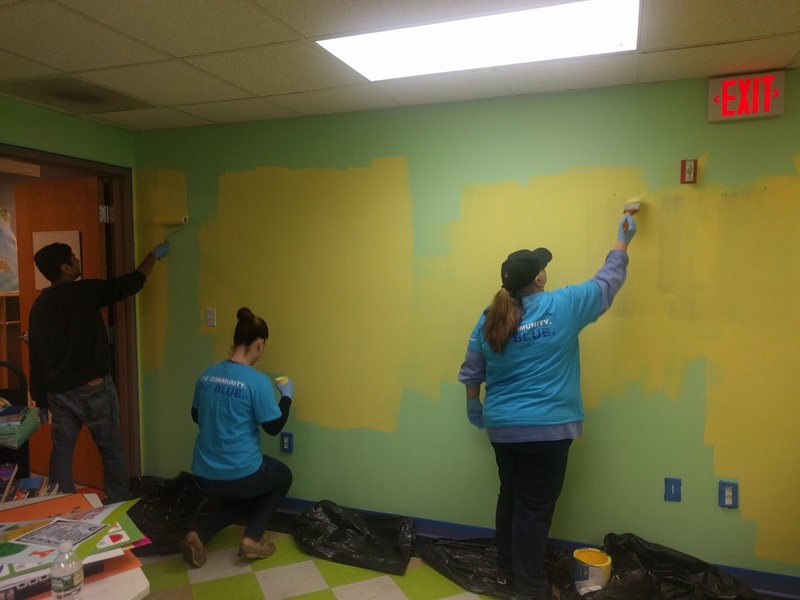 & Gilda F. Strazzula Foundation, TD Charitable Foundation, UDR, Kyle & Sara Warwick, and Winthrop Parks and Recreation. Well, the summer did come to an end, but Save the Harbor hosts year round trips to the islands, even in the fall. I was proud to be invited to work back at the site where it all started, Spectacle Island. However that day was different, David was not there, it was not the exact same team, and it was not a bunch of camps, there were groups of families. We gathered in front of the Dunkin Donuts checking people in, and when that was all said and done, we were ready to set sail! The Provicetown II set out towards Spectacle Island. I worked fishing that day, and there were a lot of mackerel around. Bruce re-rigged the rods to a unique double hook style, and taught us a new technique called retreating. When you cast the rod you don't let it go all the way down and pull the rod up every 15 ish seconds, and we saw mackerel all around, but unfortunately we did not catch any. 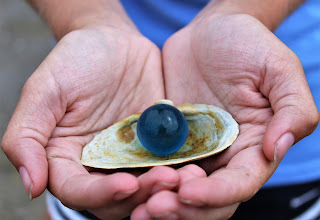 People relaxed and enjoyed themselves at the fishing station, while others did hiking, and treasure hunting looking for the blue marbles that could possibly win you free Jet Blue tickets. People got their pictures and were entered into the contest, but that was how the day went, and I was so happy to be back! Today was actually relaxing and I entertained so many kids. So I was with Ray at the Treasure Hunt/ Fish Printing Station and we had so many creative kids do beautiful fish prints. There was a group of cousins that came to us and they all had a creative color ideas and they were such a cute family. Then a man came up and was taking pictures of the kids doing fish prints; he was from Time Magazine which intrigued many of the kids because they were surprised to see they'd be featured on something so extraordinary. It was a calm day and we made plenty of jokes on the boat there and back, we're a family and it's going to stay like that. I noticed that a while ago and it's a beautiful feeling to have a second family to turn to. My friend with the pretty fish print. Today I had the wonderful opportunity to come back on the Provincetown 2 boat with a bunch of different families and friends to enjoy a free ride to Spectacle Island. There were over 300 families that came on this wonderful trip to come and have a great time with us. The STH/STB crew had a lot of fun activities planned for the trip such as fishing on the dock, fish printing, hiking, flying a kite, and finding cool treasures on the beach. I was one of the STH people that did fishing & fishing today was great because I learned how to tie a double hook on a rod to catch some fish. Today was a great day and can't wait to come back real soon. Spectacle Island has been so much fun all summer long it's so sad that today was my last day coming here! Today I did fishing with Max and Qalid. We had families and friends who came to the island this time. We had fishing, fish printing, hiking and much more. We didn't have luck with fishing--I was the only one that caught a crab and I dropped it because it was going to pinch me. I missed touching crabs and interacting with the kids and families. 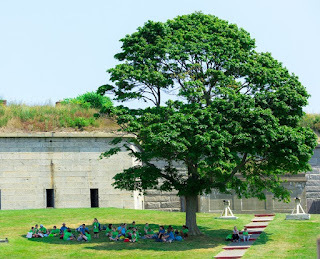 I'm so glad that we have one more trip to Georges Island and I really can't wait to go. On Saturday, I went to the North End Against Drugs. It was fun they gave us free cook out food and ice cream, apples, and much more. We had fish printing and it was fun when everyone passed by us and everyone was like "wow are those real fish"!? The kids loved it. Parents also did some prints. I hope they do this again next year! 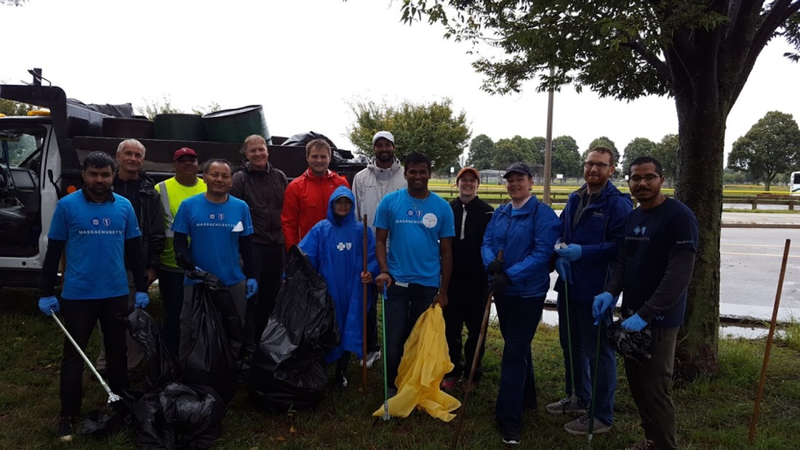 This weekend Save the Harbor Save the Bay welcomed the fall season with a free trip to Spectacle Island for the region's great communities. I jumped at the chance to venture to the island one last time, reunited with my former All Access team and reliving the gold old days of this past summer season, providing children and their families with some fun under the sun. Though, it wasn't very sunny at all, in fact there was a dense fog encompassing the harbor; so thick we could hardly see the railings of the boat. I walked onto the bow and witnessed a young group of siblings caught in awe, like me, they had never been on the harbor and sailed through something like that; "spooky" to say the least! Luckily for us, we arrived on the island just as the fog was seeming to break. with us we had brought fish printing materials, kites, and a whole bunch of fishing rods for the families to sink their teeth into while on the island. The fog enticed families to hike up the island's northern drumlin and try to look out onto the harbor. From the pier where we were fishing, the whole city seemed as if it were floating on a cloud. Fortunately for us, none other than Bruce Berman, fisherman and chef extraordinaire, and the company's director of Strategy and Communication, was on site and in action. We had received a tip that Mackerels were biting and he knew just what to do, re-rigging some of the fishing poles with double-hooks and instructing us on how to get the fish jumping. Unfortunately for us, we're not all fisherman extraordinaires and were unable to hook any of them. Save the Harbor is also sponsoring another free trip to the islands this coming October-- this time to George's Island-- so definitely stay tuned for that! 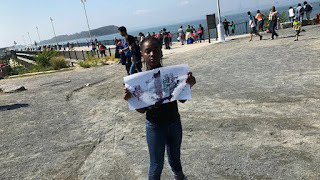 This Sunday I went to Spectacle Island and I did hiking and flying kites with my FAVORITE, Patrice. Before we got on the boat we had to direct everyone on which way to go and it felt different to deal with families instead of groups or summer camps because the kids felt more comfortable and more outgoing with their families. It was also very nice to see everyone have fun, smile and laugh with their families, I have never seen so many kids have fun like today than the whole summer. The kids had so many questions on what we could do on the island and when they heard about the kites they almost went crazy! After we got off the boat I found out that I was assigned to fly kites and do hiking which was in my opinion the best activity on the island. It was pretty hard though considering that it was VERY foggy, we could not see the top of the hill or farther than about 20 feet away. It cleared up throughout the day, on the way back we sang Haul Away Joe at the top deck. The view was amazing it was one of the best rides back to land, I can't wait to come back! I had the most amazing day yesterday. 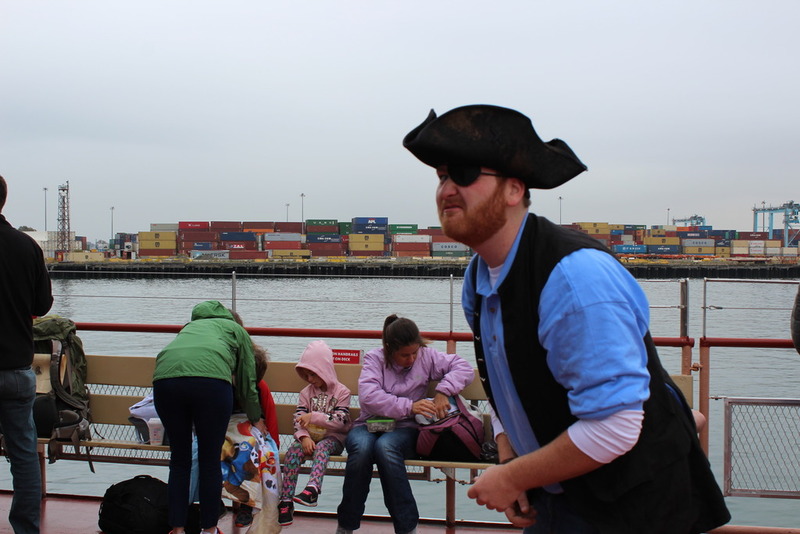 I asked to be put on the job for the Spectacle Island trip. I skipped my pregame practice for this job and anyone who knows me knows that I never EVER skip soccer practice. But the All Access team had been planning this. We missed each other so much and wanted to see each other so badly. So we all signed up to work and see each other on Sunday. I can't explain how amazing it felt to give everyone a hug and be reunited. Sure we missed Kharliyah and her laugh, Henry's presence, and most of all Jenn the mermaid, but we couldn't be happier to see each other. Even though it had been nearly a month since we all worked together, it came back to us with no trouble at all. I helped Amy check people in, Vince ran back and fourth giving us the count of how many people got on the boat, and Max simply observed us all. When we got to the island, we all split up into our separate jobs. Vince and I were in charge of hiking, Max, Qalid, and Marly were all fishing off the pier. After we finished our hiking session, we headed over to fishing. Now it really felt like old times. We all rotated casting, baiting, and helping the kids fish. The best part came on the boat ride home. We all gathered on the very top deck to sing with the entire boat our special sea shanty. 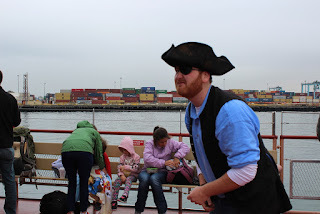 It was amazing how the entire boat sang along with Chris the pirate and the STH/STB staff. It made my heart fill with joy as everyone who stepped off that boat thank us genuinely and asked when the next trip would be. It makes me feel good because I knew that I contributed to their great day. Many of these people had never been to the island before and now they knew how special it was. One woman asked me what town we were in and I told her we are on Boston Harbor and she was shocked. 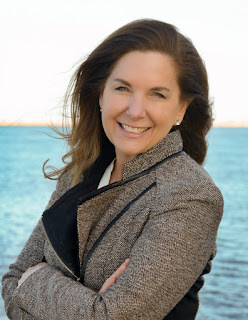 She had lived in Boston her whole life but never knew that these islands existed. Once we returned the supplies to the office, the All Access crew was leaving and I received a FaceTime call from Jenn. Everyone crowded around the phone and we all screamed hello into the phone. The smiles on our faces were like those never seen before. It was officially the best day ever. Finally back with Save The Harbor! After a long month without working at Save the Harbor, I really enjoyed getting to work with some familiar faces and having fun at the North End Against Drugs event. 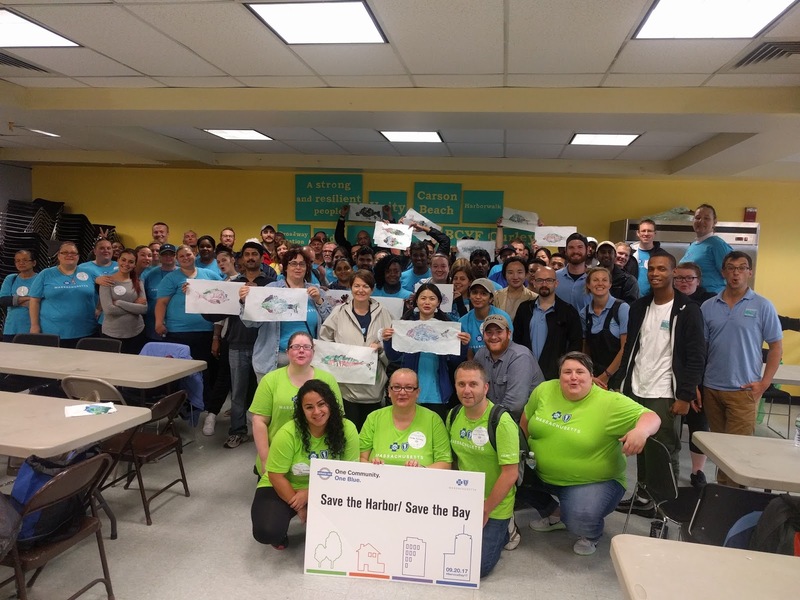 The North End Against Drugs event on Saturday, September 16th was a great event packed with fun, food, music, animals, and sports. The rest of Save The Harbor and I had a table where we taught people fish printing, and along with our table their were also tables for art and other activities. For the fish printing we had brought with us a flounder, along with two other smaller fishes. The smaller fishes were hard to use for the purpose of fish printing, so must people did their prints using the flounder. Throughout the day we had many people that were fascinated and surprised by our fish printing, some of these people were intrigued enough to create their own print. Along with all the great fish printing I assisted on, I was also able to visit some of the bunnies, goats, and birds present at the event. I wasn't able to work up the courage to hold one of these animals, but it was still cool to be able to see them up close and personal. All around this event was really great, and it was awesome to see some of my friends and co-workers from the summer. On Sunday the 18th of September, Save the Harbor/ Save the Bay(S.T.H./S.T.B.) was hosting a free trip to Spectacle Island! The fog that was present that day was absolutely abnormal. If I wasn't so excited to see the fog, the atmosphere could've been seen as an eerie. We had sign up list that indicated that roughly a thousand folks would join us that day, but due to the fog and weather conditions, a lot of folks got deterred. On our journey to Spectacle Island, the fog was so thick out in the harbor that anything beyond fifty feet was not visible. The usual Boston skyline was not present, nor was there the usual vast blue sky. Figure 1. After several hours, a lot of the fog had cleared up, however one could still see how much fog was present in the horizon. With a majority of the S.T.H. staff geared up in pirate wear, we cruised to the island and started our sections of fishing, fish printing, kite flying and hiking! Figure 2. Shown in the picture above is the Hula-hoop section, where folks gathered around to show their exquisite talents. After fish printing with Schup, Mackerel, and Flounder for about three hours I can say I saw a lot of interesting things that day. At around 10:30 AM, I saw a mom attempt to fly a kite. She went for a chaotic run to try and fly the kite high enough to get it up in the air. After a failed attempt, I tried to get the kite going. I retired my short lived kite flying career after my attempt and offered it to the kids that were eager to follow my foot steps by running with the kite. Visitors left and right came up to view if the fish we were using were real. People shared their stories like where they are from and what they do as a profession. I had the chance to meet this one guy from the Philippines who was a professional photographer. He ended up taking photos for folks who had children fish printing. This professional photographer worked with Times Magazine. Once Times Magazine was mentioned, folks were voluntarily offering to be in the photos taken by the Professional photographer! Figure 3. One of the kids that enjoyed fish printing volunteered for a photo opportunity! Figure 4. A view from the top of the boat of some of the lovely visitors that we had that day aboard with us to and back from Spectacle Island. Thank you guys for reading another blog post from myself, I hope you'll catch my next post whenever that will be. For my last few days with Save the Harbor/ Save the Bay this summer I was given the opportunity to step up from my current role and act as a Senior Harbor Educator! It was definitely a new and different experience to take on the higher position within our work environment. From my experience as an LHE and working with past S.H.E. I was able to make a easy transition to getting my group to work to their strengths and cover for each others weaknesses! The fact that I was placed back at Pier's park brought me some comfort as I knew the programming for this site all too well. These last few days at Pier's Parks my JPAs: Maeve, D, Jahari, Kamal, Imani did a phenomenal job at pulling their weight and engaging the youth! School is around the corner, and it was easy for a lot of the youth to have the mentality to be more carefree, but these guys were superb! They showed the same enthusiasm playing games similar to tag with the youth since the start of the summer. The site itself has changed over the years in some aspects as well! Seeing the Pier's Park team transition staff around as well as seeing folks rise to higher roles and the consistency in happiness levels of everyone makes this site astounding. At times I am envious of the opportunities the youth have, as I too wish I had the chance to be apart of the Pier's Park sailing center's Harbor Explorers program. I would like to give special thanks to Amy, Bruce, Chris, Patty, and much more staff for giving me this opportunity to work with amazing individuals to make a difference to not only the harbor, but the lives of the next generation! In the many many years to come, if Pier's park sailing center is at least a fraction as to how amazing it was these past two years for me, I would have my children signed up to be apart of this program! This summer has been a blast, from all the days of working in the sun, running around like a mad man with children tailing me for yards, I have had a fulfilling summer with growth in my personal abilities as well as many days of laughter!